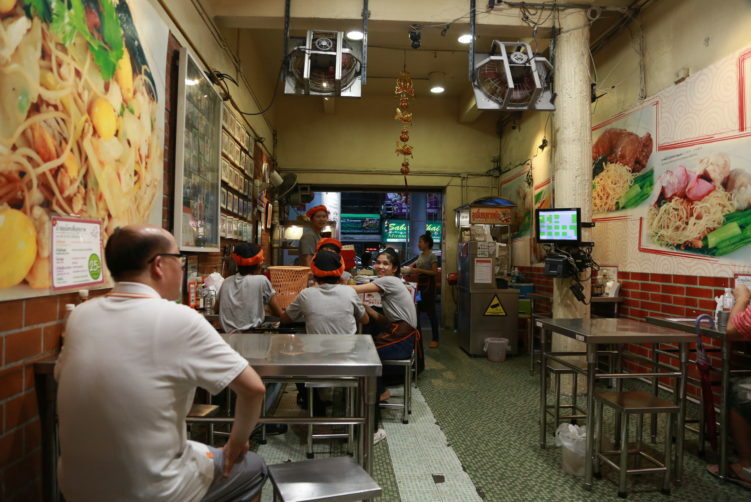 Some say Nai Meng Noodles next to the Silom Complex Shopping Mall serves the best ba mee (egg noodles) in town. I don’t agree with that, but they certainly serve you a very good bowl. The noodles are home made and they know how to cook it. The add-ons comes in numerous alternative. aIf you’re a first timer go for the big bowl with everything to find your favorite ingredients for your next visit. The menu at Nai Meng Noodles might be slightly confusing, but you will soon see that they have two categories of food. Noodle dishes and rice dishes. 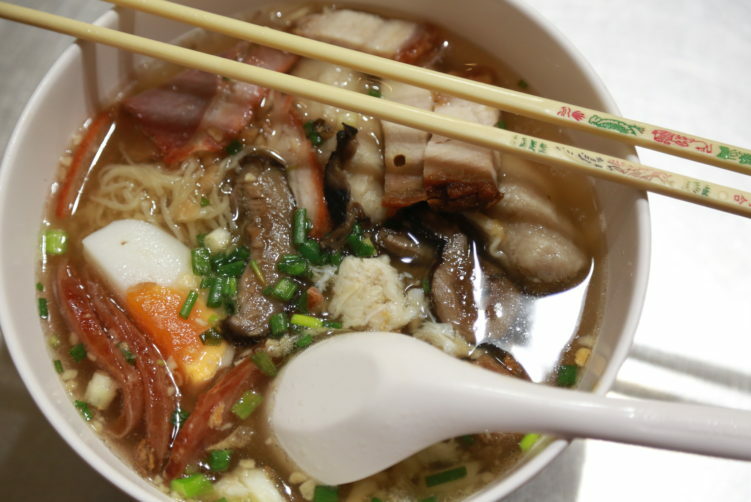 The noodle alternatives comes with soup (nam) or without soup (haeng). Let’s start with the noodle category, my prime interest when it comes to Nai Meng in 183 Silom road. You have plenty of choices when it comes to the add-ons. Alternatives include crab dumplings, giant shrimp dumplings, pork dumplings, red roast pork, pork ribs and crispy pork. They are all good, but my preference for the dumplings is the shrimp dumplings. My choice this time was egg noodles with crab meat, jumbo shrimp dumplings and roast pork. Absolutely a very good bowl that makes my stomach purring. And of course, don’t forget the soft boiled egg. Another recommendation is to eat the crab meat first if you order the soup version as it easily dries out in the warm soup. The rice category includes alternatives such as stewed rice, gravy roasted pork, sweet pork, red roasted pork, crispy pork belly, chicken in soy sauce. All very decent alternatives. The gravy on top of the roasted pork and/or crispy pork is absolutely good and not overly sweet as you get it most places due to Thai’s rather sweet tongue. 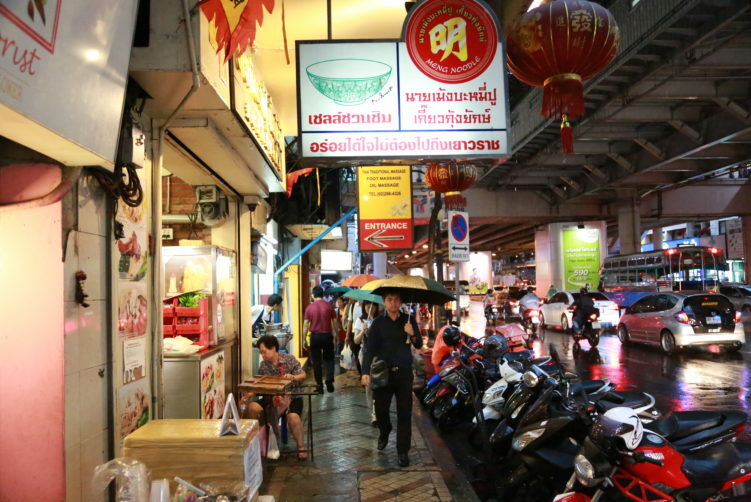 Nai Meng Noodles is one of the more Chinese style egg noodle shops in Bangkok. Prices are slightly higher than your regular street stall and runs from around 60 Bath to 130 bath. 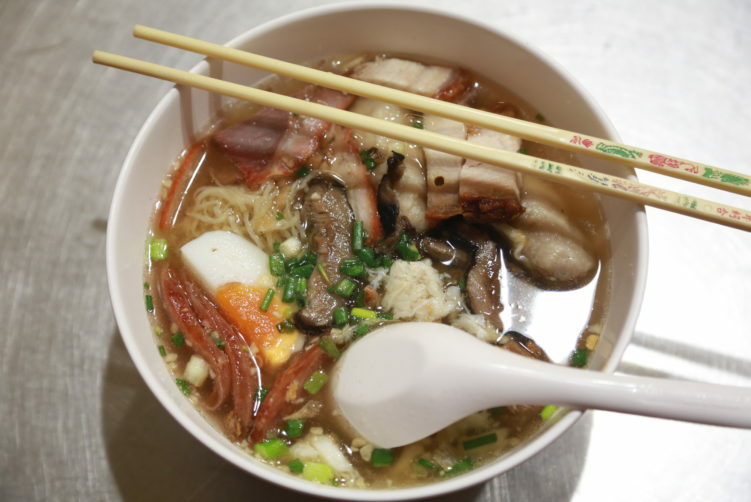 Nai Meng Noodles are good for a quick meal. The staff is friendly and helpful and also quite fast. Be aware that it can be quite full around the prime eating hours and especially for lunch. The room is air-conditioned and they also have a second floor. Nai Meng Noodles has en English menu. Nai Meng Noodle also have branches at Bang Kae and Soi Ari (near BTS Ari). I have not visited those branches. It is also worth mentioning that they have the Shell Shuan Shim award. Check out my Bangkok Food Map for other eateries in the area or elsewhere. You can also check out several other near by street food vendors in my archive for the area. 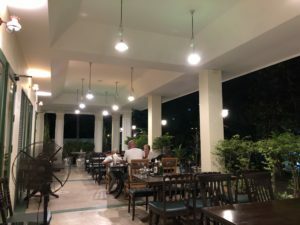 I have also written an article on Street food in Convent Road and Sala Daeng Soi 2 that might be of interest. click here Price: The big bowl with everything is almost 130 Bath so not cheap. Other bowls comes at prices around 60 Bath. Address: 183 Silom Road – Next to Silom Complex Shopping Mall. How to get there: Take the BTS to Sala Daeng, Exit # 4 and walk a few meters towards Soi Sala Daeng and you’re there. Nai Meng Noodles next to the Silom Complex Shopping Mall serves very good ba mee (egg noodles). The noodles are home made and they know how to cook it. The add-ons comes in numerous alternative. See full review at StreetsideBangkok.